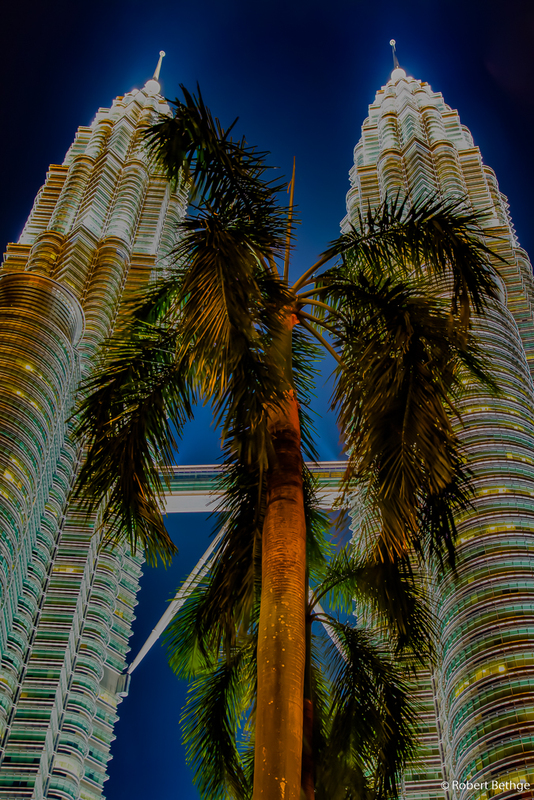 How did I get to shoot photos of the Petronas Towers in Kuala Lumpur, Malaysia during my stay in Thailand? Note by how much the Petronas Towers “overtower” (pun fully intended) everything around them! When entering Thailand on a tourist visa, which is just a stamp in the passport, you have to leave the country after 30 days. The visa runs that used to be popular, where people headed to the border with Myanmar or other countries bordering Thailand in buses or mini vans, were eliminated when the policy was changed to only give 15 days on arrival by land. So the only remaining option to extend your stay beyond the 30 days is flying to another country and returning. Bangkok as the main hub in South-East Asia of course offers countless flights to international destinations, but since I was staying in Chiang Mai in the North of the country, my options were much more limited, if I wanted to fly directly. Interestingly enough, the most affordable option offered by the local discount airline Air Asia ended up being Kuala Lumpur in Malaysia. 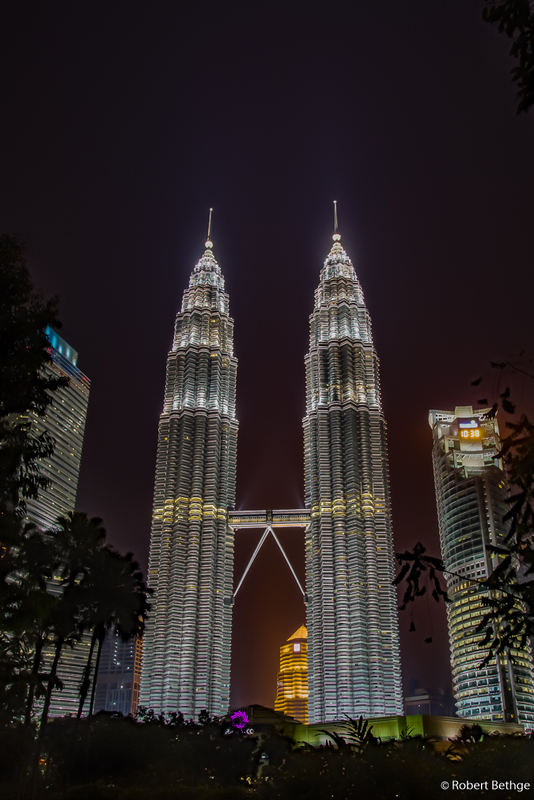 I always wanted to see the Petronas Towers, so to Kuala Lumpur I went, even though there are options that are much closer, such as Vientiane, the capital of Laos. 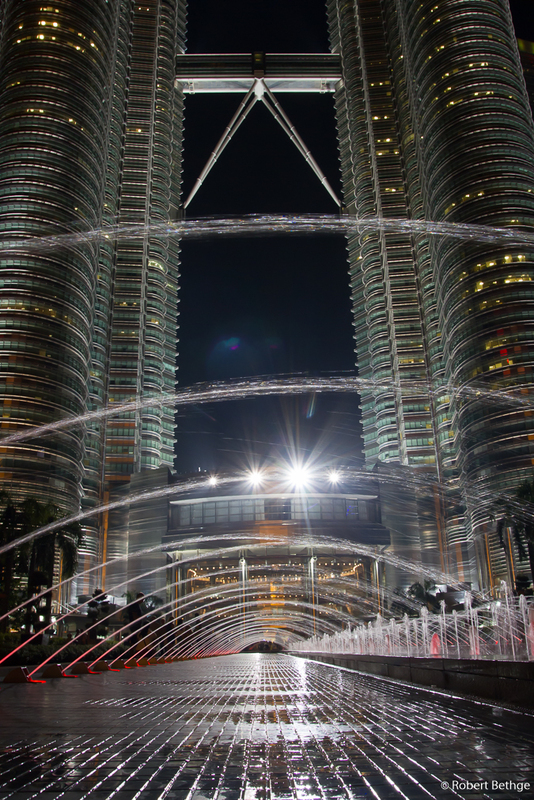 The Petronas Towers ended up being every bit as impressive as I expected. 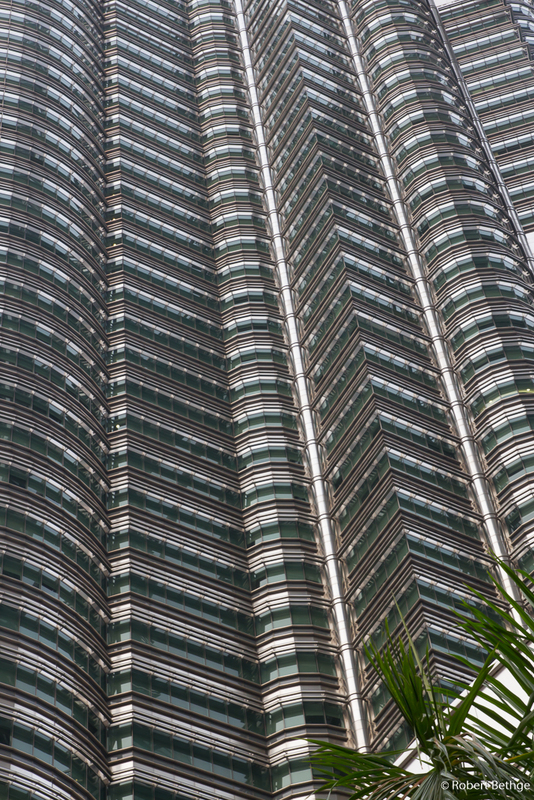 At 451.9 m they were the tallest buildings in the world from 1998 until 2004, and still they are the tallest twin towers. 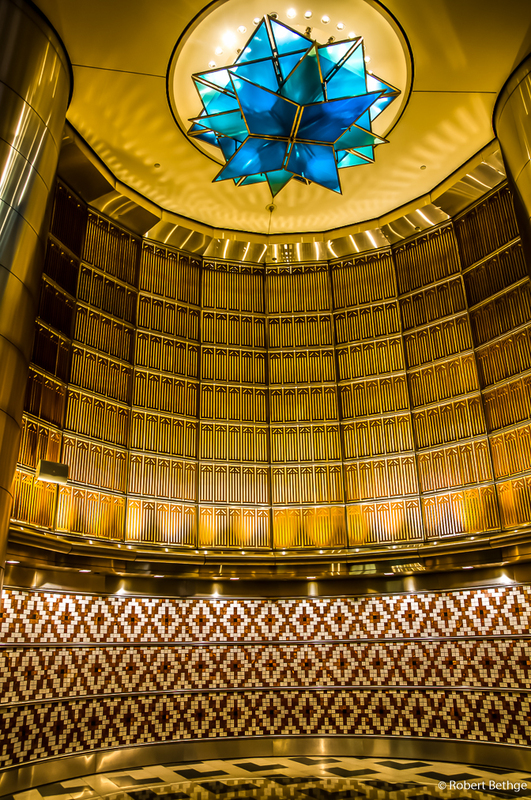 Muslim themes are said to be used throughout the design of the towers, which shows quite clearly in the lobby. 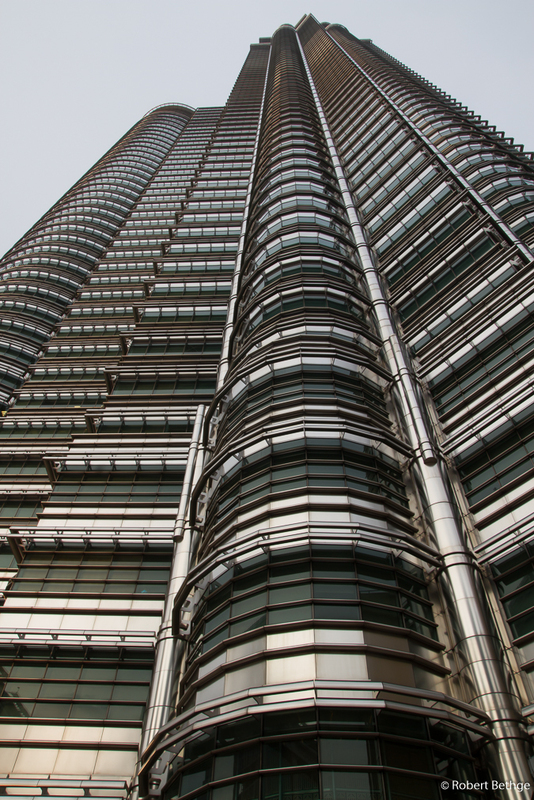 Even though the Petronas Towers are completely clad with stainless steel and glass, they are actually made of concrete, which is kind of unusual for buildings of this size. 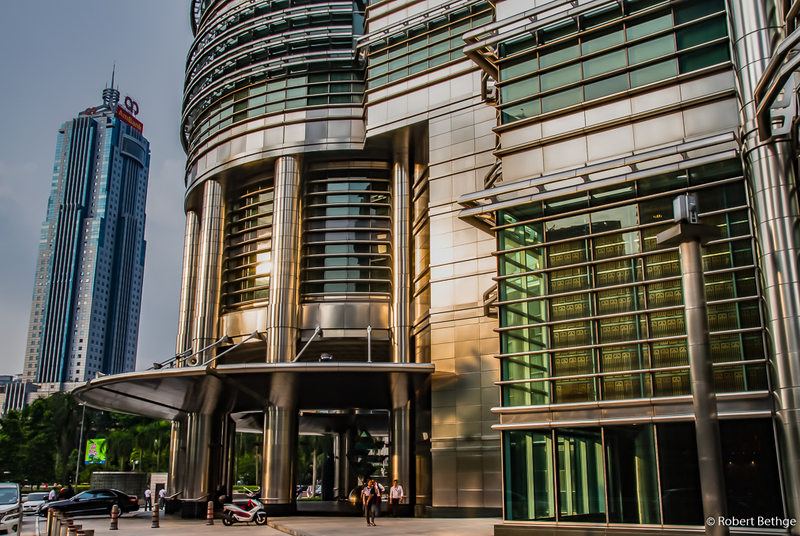 Steel is very expensive in Malaysia, so the architect resorted to concrete, which makes the buildings a lot heavier, putting additional strain on the foundation, for which dirt 30 m below the surface needed to be dug out. During construction, when Tower 2 had reached the 72nd floor, it turned out that the tower was leaning 25 mm (about 1 inch) from vertical. The engineers, not keen on building the another “Tower of Pisa”, slanted the remaining floors slightly in the opposite direction and surveyors had to monitor verticality twice a day from then on. So far, they’re not falling over! 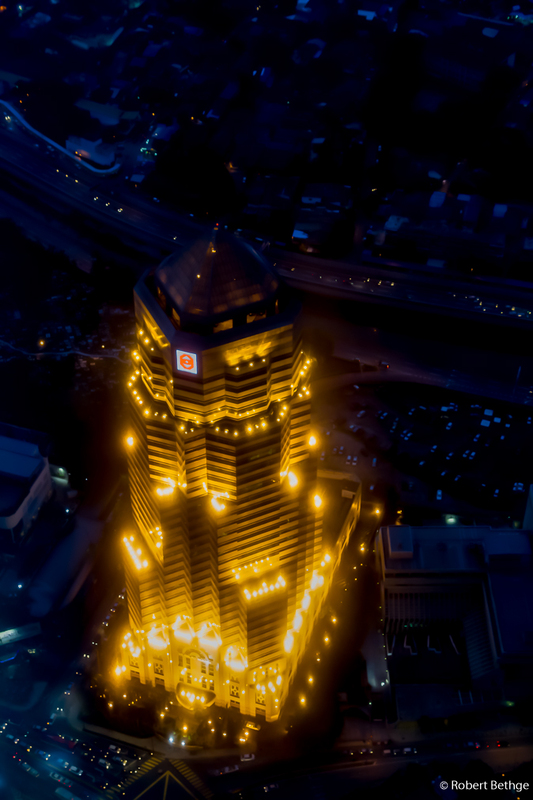 The Sky Bridge is currently closed for visitors, but the 88th floor can be visited. Don’t just show up at the towers expecting to go up immediately or even on the same day. People line up early in the morning, in the hope to purchase a ticket for the same day. 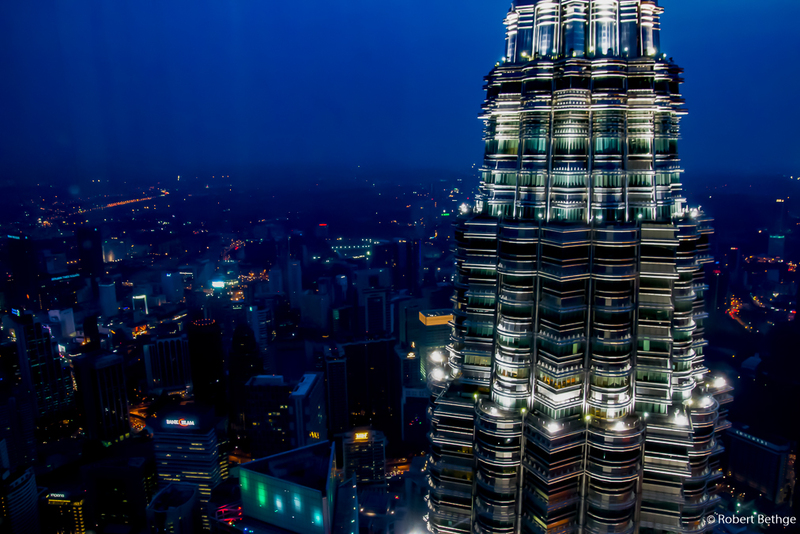 If you can plan your visit a couple of days in advance you can buy a ticket online at http://www.petronastwintowers.com.my. Then you can just show up an hour before your scheduled tour, pick-up your ticket and go up. Very convenient! 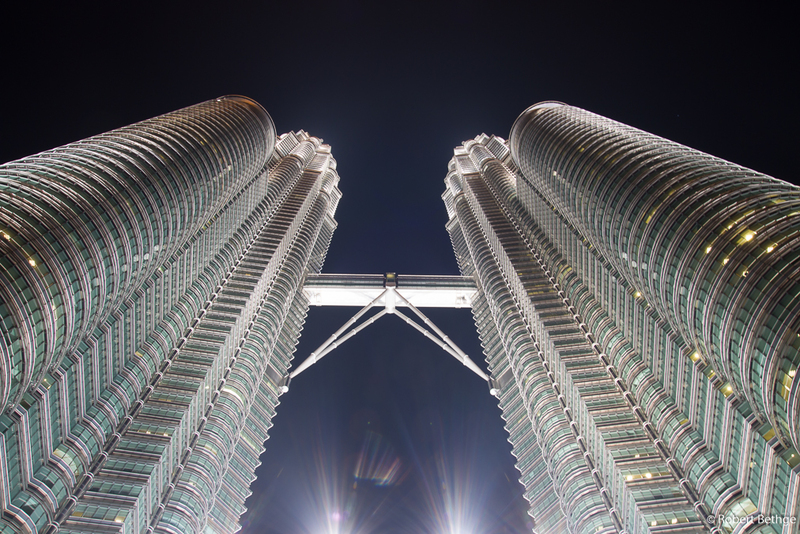 But even without going up, the Petronas Towers are worthwhile visiting. 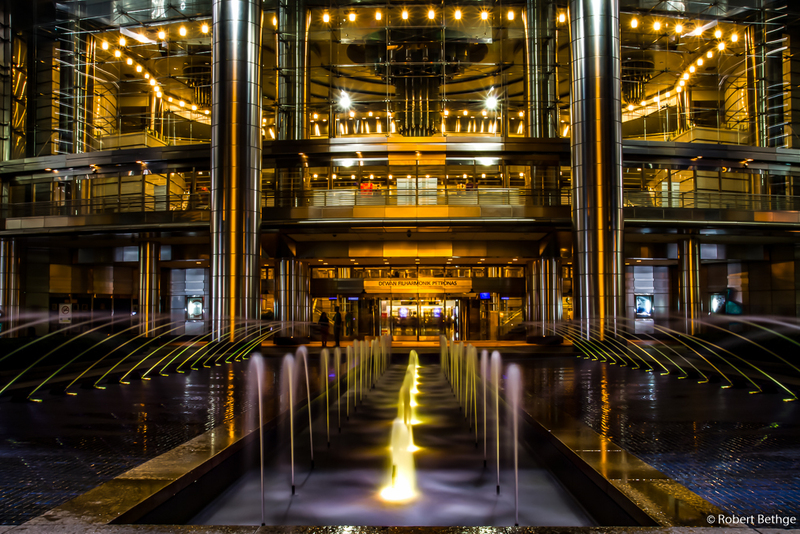 The architecture is extremely stunning, glass and stainless steel surfaces where the eye reaches. Also the lobby is very beautifully designed and lit. 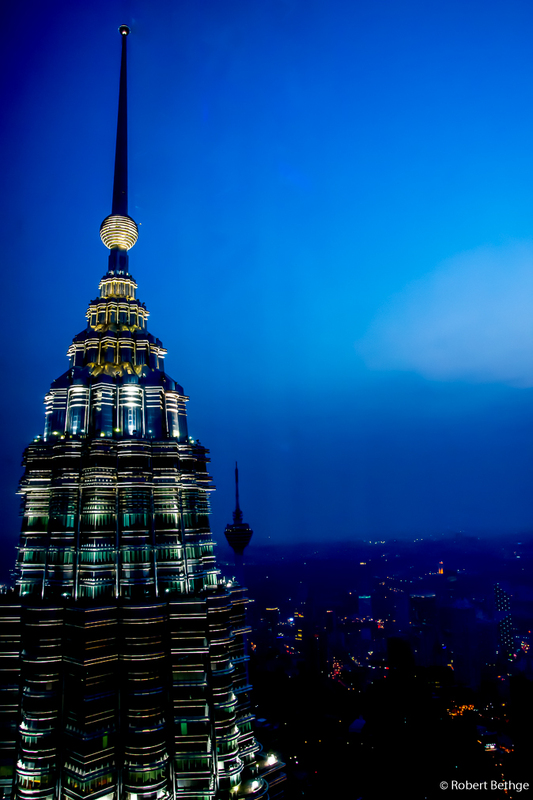 The best time to visit the Petronas Towers is in the early evening, when the lights are already on, but go before midnight, when they are switched off. The guided tour leaves 20 min. for enjoying the views and taking photos. Note that tripods are not allowed upstairs, but you can leave yours at the reception in the lobby. 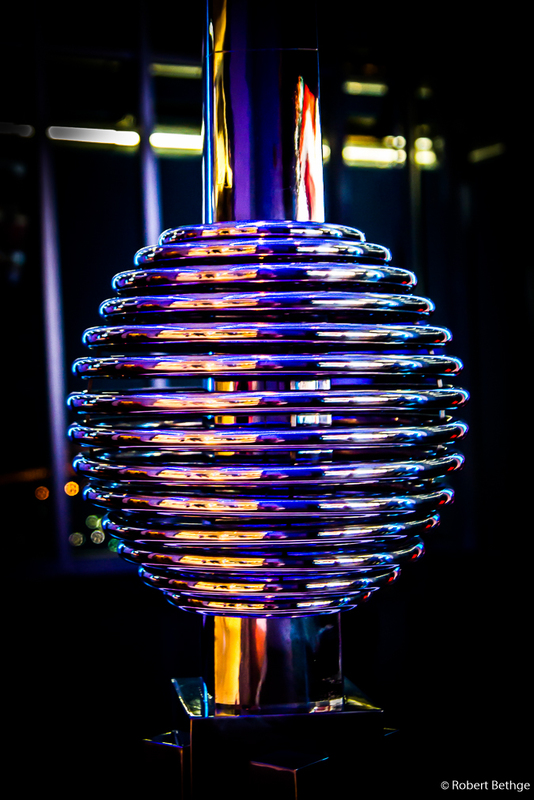 Don’t leave your tripod at home, though, because it will come in handy for taking photos outside. A park surrounds the towers, from which you have stunning views of the beautiful towers. Take your time to walk around. 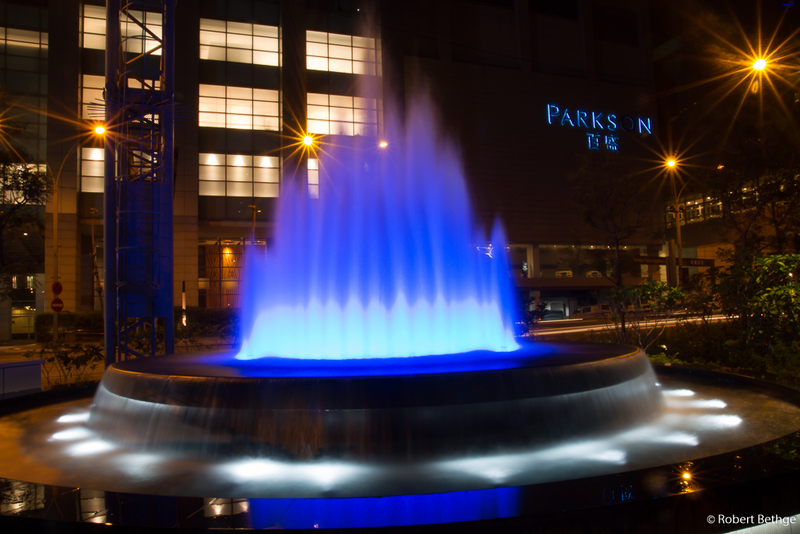 At the foot of the towers is the Suria mall, if luxury goods are your thing (it ain’t mine). 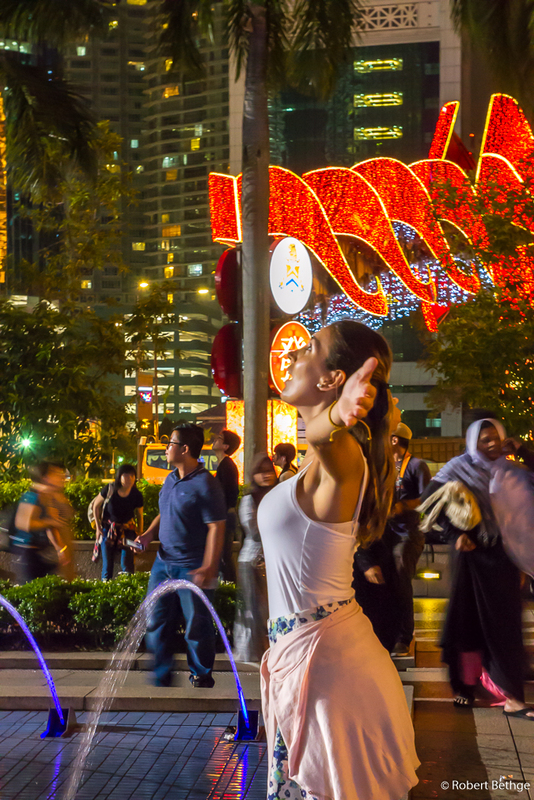 There are beautiful fountains in the park, and there is a show at night that reminded me a bit of a similar display at the Bellagio in Las Vegas, where are fountains are made to dance to music. The only way I could take the picture at the top of this page is by standing in the middle of 4 lanes, busy street, with tripod and all cars heading towards me! What don’t I risk for a good shoot! 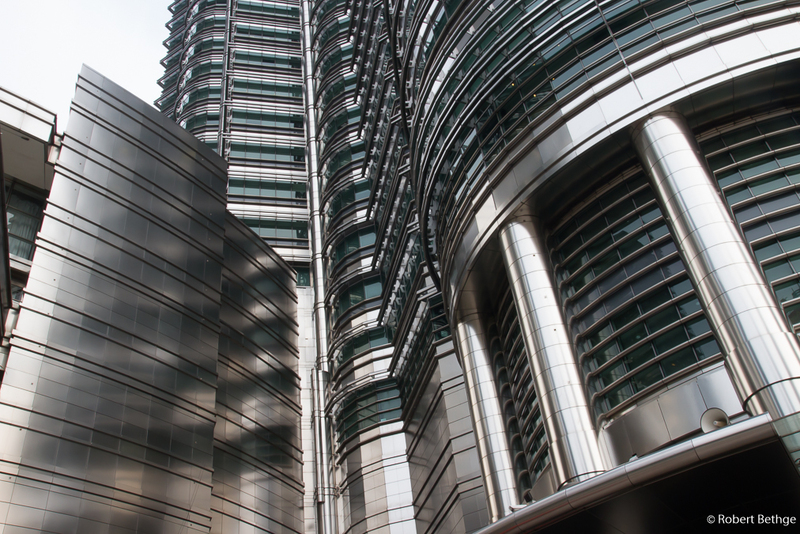 The Petronas Towers are a short and easy walk from one of the main centers of Kuala Lumpur called Bukit Bintang, where I was staying.